Buckeye Beer Engine has to be one of my favorite places in Cleveland. I’m shocked I haven’t written about it. It opened in 2007 and is located in Lakewood on Madison Avenue. 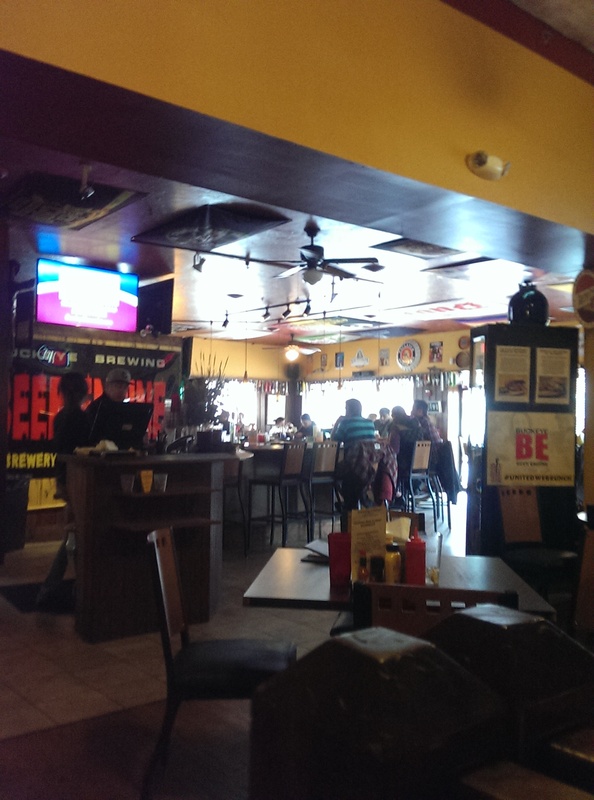 It is a locally owned, neighborhood brew pub that prides itself on gourmet burgers and gourmet, award-winning beer from Buckeye Brewing Company. If you are looking for a place to explore specialty craft beers, this is one of the better places in Cleveland to do it. In addition to 27 premium draft beers, Beer Engine also features two authentic cask conditioned ales, and 100+ bottles to choose from. I like that the draft beer list tells you what glass the beer will be served in. Not enough places do this, and the shape of the beer glass really does play a role in the enjoyment of a beer. Belgian beers should be served in round glasses, pilsners in long, tall, thin glasses, etc. There is nothing I love more than a good Belgian beer. This one was the “EPIC Brainless on Peaches,” which is a Belgian blonde ale aged in French Chardonnay casks on peaches. With just a hint of peach underlying the delicious blonde ale, I was a very happy camper and savored every drop. 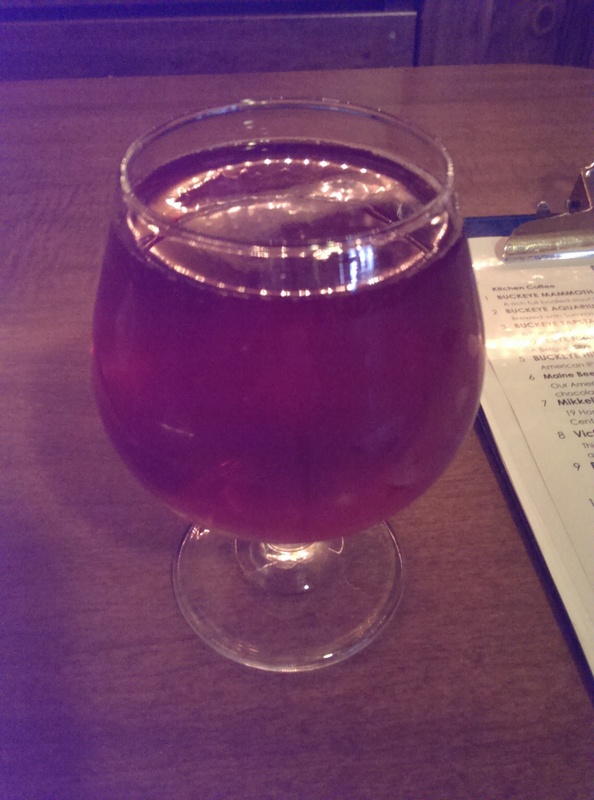 And with an ABV of 10.80, I walked out of lunch with a very slight buzz, so be forewarned. Or be prepared to call Uber. The food is always good. With a small kitchen they limit their menu to items that are primarily grilled or fried. And let’s face it, if you are drinking beer you don’t really care about calories. They offer lots of appetizers that are perfect for sharing, like fried pretzel sticks and beer cheese and mustard dips, wings, “beer caps” (deep fried jalapenos), battered Andouille sausage bites, mac n cheese bites. etc. 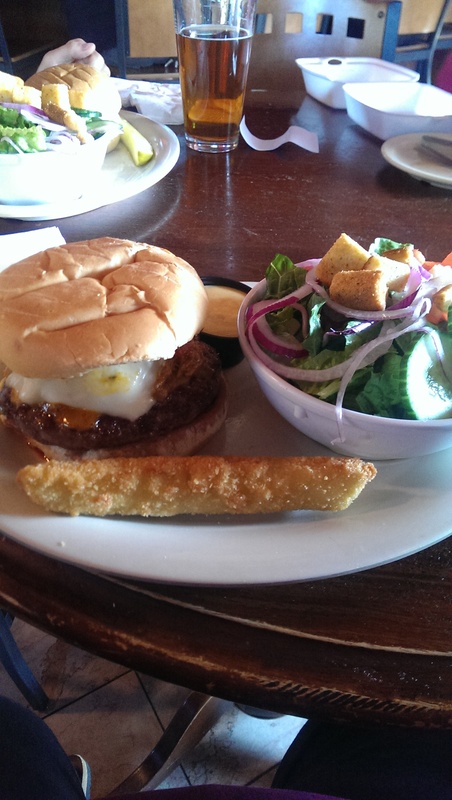 They feature 20 half-pound burgers as well as sandwiches, salads, platters, many appetizers, and weekly specials. All of the burgers can be easily switched to a Portobello mushroom cap, grilled chicken breast, or homemade spicy black bean patty that makes my vegetarian friends very happy. They feature a burger of the month, a monthly “wildly improbable burger,” and frequent specials. 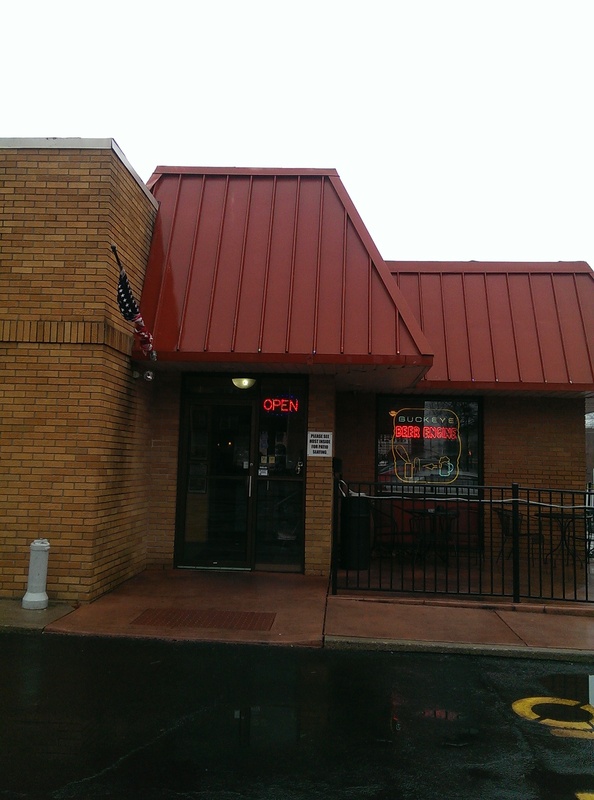 They also have a pretty wide selection of entrees that aren’t listed on the website, such as beer cheesy cheesesteak, meatloaf, a sausage platter, a schnitzel platter, a gouda pork & gravy fries (similar to poutine), and salads. For example, for the entire Lent season they are offering New England clam chowder, conch and crab hushpuppies, linguini frutti di mare (after 5 PM), a beer battered cod hoagie, beer battered fish and chips and drunken mussels. I also saw a sign for a salmon burger. The first time I came here I ordered the Kobe beef hot dog in a pretzel-bread bun. It’s no longer on the menu, but I loved the fact that they served Kobe beef hot dogs. They now serve Angus beef, but kudos for going for quality from the starting gate. My absolute favorite burger is the West Side Burger, featuring caramelized onions, sour cream, cheddar cheese and one cheddar potato pierogi on top of a juicy half-pound patty. If I am in the mood for a great burger this is my go-to. The onions are always perfect and the pierogi is just such a fun addition to a burger. The burgers are served with chips, but you can upgrade to a side salad, sweet potato fries, tater tots, or other choices for a couple bucks more. The chips are light and crisp and perfectly salted, so I highly recommend trying them first before you start upgrading. 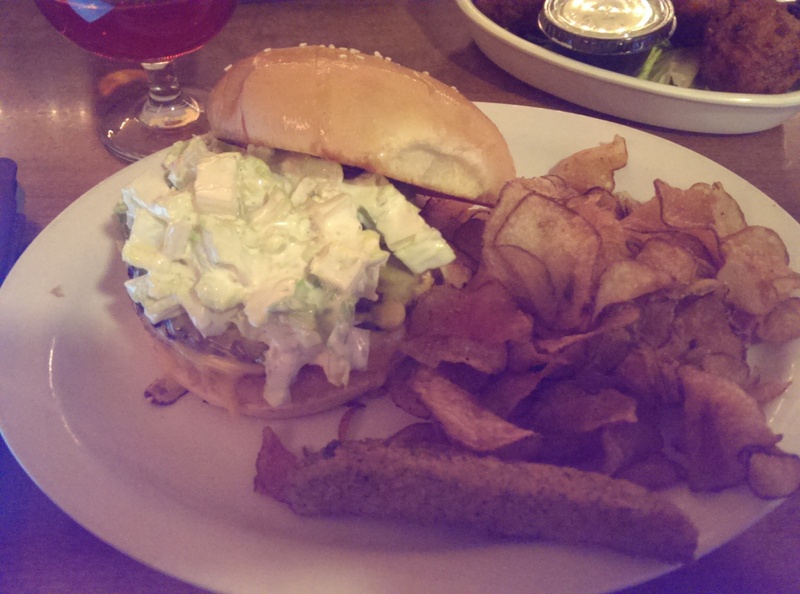 Every burger is also served with a fried dill pickle spear, which is a whimsical little addition. Their everyday soup is the Chicken Cheddar Ale soup. It is a homemade soup made with chicken-ale broth loaded with cheddar cheese, roasted chicken, red peppers, and onions and topped with crumbled bacon, scallions, cheddar cheese, and served with mini pretzel sticks. I had a bite of it the other day when they mistakenly gave it to me instead of the clam chowder. The soup is surprisingly thick and very flavorful. The roasted chicken is shredded, and the soup is loaded with it. 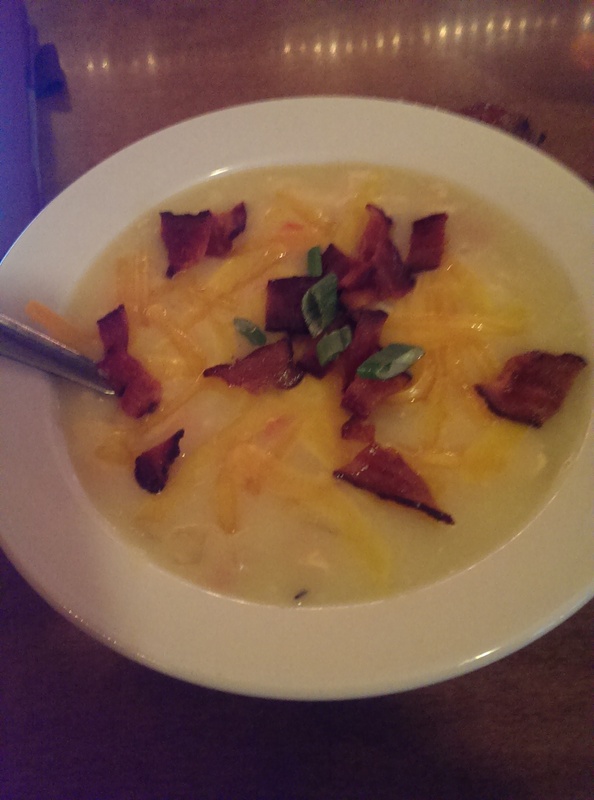 The New England clam chowder is a total winner, and I was glad that I didn’t just keep the cheddar ale soup. It is in the white chowder base and has lots of clams and small potatoes. I was delighted with the flavor, which was almost buttery to my palate. I almost regretted ordering just a cup and was tempted to order a bowl to go. 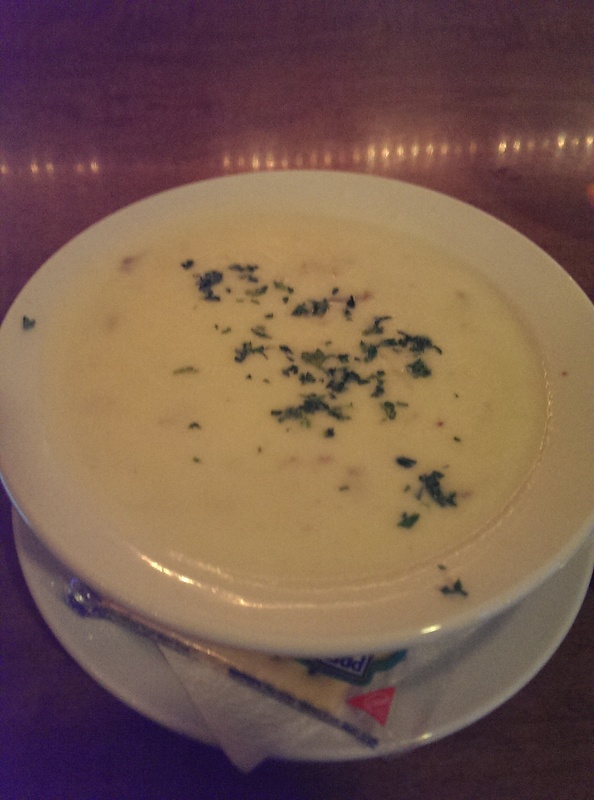 If you love clam chowder be sure to give this one a try. I have to say it is one of the best chowders I have enjoyed in a restaurant. They comped my chowder due to the mix-up, but I would have happily paid for it. Mistakes happen, and they more than made up for it. 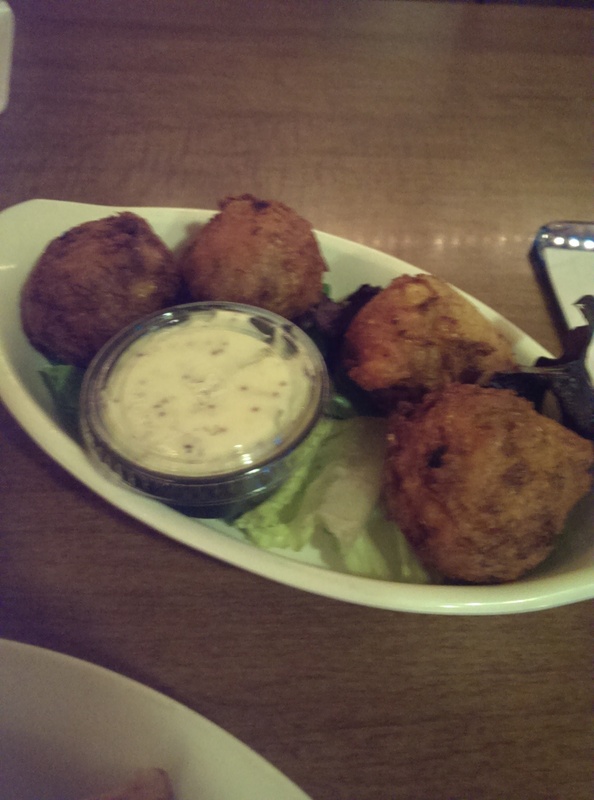 I could not resist the house-made conch and crab hushpuppies when I saw them on the Lent Specials menu. I told my waitress I would probably be taking them to go. She gave me a to go box before they came out, and served the dipping sauce with its lid. That’s service! 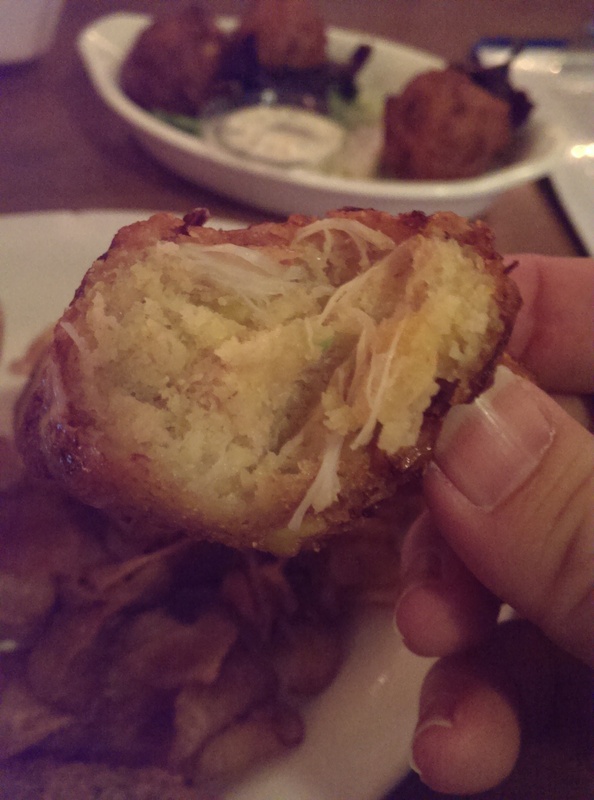 The hushpuppies were perfectly fried, not too oily and with a crisp coating. The inside was soft and delicious and loaded with seafood. The filling was a mix of crab and conch meat, corn, and scallion. It was served with the Beer Engine whole grain mustard aioli, but I was perfectly happy eating them straight without the aioli. I had one and boxed up the rest. My most recent burger was the Bob’z Big Boyz Burger, which was a nod to the Big Boy. It was a burger of the month, but is now on the regular menu. It is a 1/3 pound burger topped with American cheese, crinkle cut dill pickle slices, and their homemade Bob’z sauce on a sesame seed bun. It also seems as if it was topped with a lot of chopped up lettuce mixed in the sauce. It was a fun burger and probably better than a Big Boy is nowadays. With the soup and a hushpuppy I got full quickly and took half of my burger home for dinner. The eyes are always bigger than the stomach. Beer Engine is open every day of the year from 11AM to 2:30AM. I hear they have a great Sunday brunch too. They have a great little patio that is very much in demand in the warmer months. I spent one lovely summer evening on the patio enjoying a West Side Burger and a couple brews with friends. I’m glad that I live so far away from it, because I would be here all the time.